The following websites offers stitchers a wealth of information. HIghlights of each are provided along with links to the sites. Either scroll down this page or use the links below to be view highlights of each site. The site of the ANG - an educational, non-profit organization whose main purpose is the educational and cultural development through participation in and encouragement of interest in the art of needlepoint. ANG defines needlepoint as any counted or free stitchery worked by hand with a threaded needle on a readily countable woven ground. ANG offers education through correspondence courses, audio-visual programs, national seminars, and both teacher and judging certification programs. 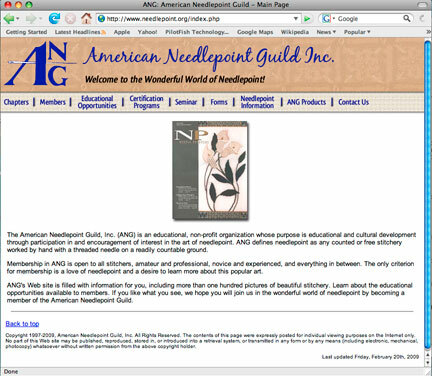 The American Needlepoint Guild, Inc. (ANG) is an educational, non-profit organization whose purpose is educational and cultural development through participation in and encouragement of interest in the art of needlepoint. ANG defines needlepoint as any counted or free stitchery worked by hand with a threaded needle on a readily countable ground. Membership in ANG is open to all stitchers, amateur and professional, novice and experienced, and everything in between. The only criterion for membership is a love of needlepoint and a desire to learn more about this popular art. ANG's Web site is filled with information for you, including more than one hundred pictures of beautiful stitchery. Learn about the educational opportunities available to members. If you like what you see, we hope you will join us in the wonderful world of needlepoint by becoming a member of the American Needlepoint Guild. 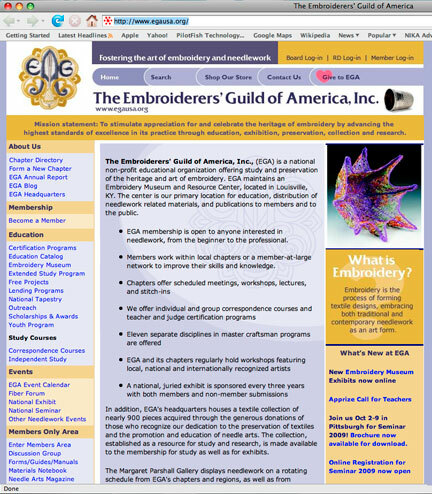 The Embroiderers' Guild of America, Inc., (EGA) is a national non-profit educational organization offering study and preservation of the heritage and art of embroidery. EGA maintains an Embroidery Museum and Resource Center, located in Louisville, KY. The center is our primary location for education, distribution of needlework related materials, and publications to members and to the public. • EGA membership is open to anyone interested in needlework, from the beginner to the professional. • Members work within local chapters or a member-at-large network to improve their skills and knowledge. 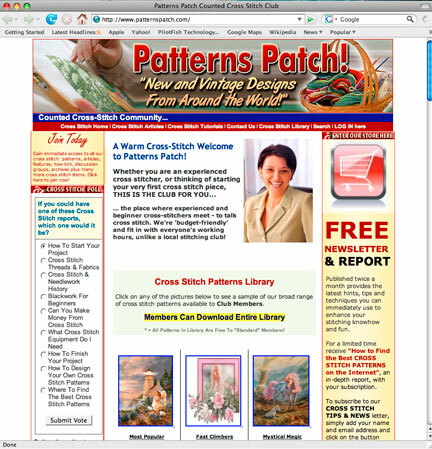 Patterns Patch is a place where experienced and beginner cross-stitchers can meet to talk cross stitch. They are 'budget-friendly' and fit in with everyone's working hours, unlike a local stitching club! Whether you are an experienced cross stitcher, or thinking of starting your very first cross stitch piece, this club offers something for everyone. The site includes new and vintage designs from around the world in their Cross Stitch Patterns Library You can click on pictures to see a sample of our broad range of cross stitch patterns available to Club Members in its Cross Stitch Patterns Library. Non members can click on any of the pictures to see a sample of their broad range of cross stitch patterns available to Club Members before joining. 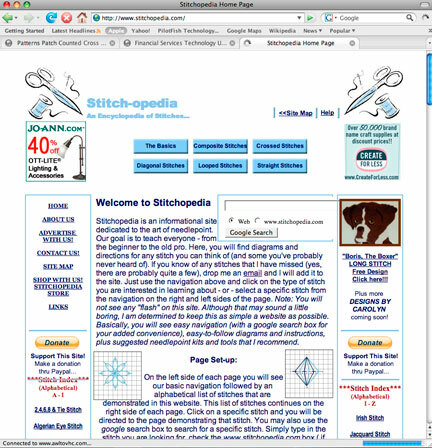 Stitchopedia is an informational site, dedicated to the art of needlepoint. From their site: Our goal is to teach everyone - from the beginner to the old pro. Here, you will find diagrams and directions for any stitch you can think of (and some you've probably never heard of). If you know of any stitches that I have missed (yes, there are probably quite a few), drop me an email and I will add it to the site. Just use the navigation above and click on the type of stitch you are interested in learning about - or - select a specific stitch from the navigation on the right and left sides of the page. Note: You will not see any "flash" on this site. Although that may sound a little boring, I am determined to keep this as simple a website as possible. Basically, you will see easy navigation (with a google search box for your added convenience), easy-to-follow diagrams and instructions, plus suggested needlepoint kits and tools that I recommend. Established in 1975, TNNA is an international trade organization representing retailers, manufacturers, distributors, designers, manufacturers' representatives, publishers, teachers and wholesalers of products and supplies for the specialty needlearts market. These businesses create and market hand painted needlepoint canvases, hand-dyed and specialty crochet and knitting yarns, embroidery, needlepoint and cross-stitch materials, kits, furnitures, notions, gifts, books, publications, accessories, tools and more. To provide a forum in which all sectors of the needlearts industry may meet and interact. 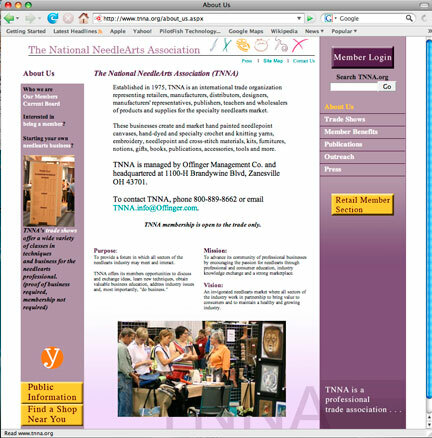 TNNA offers its members opportunities to discuss and exchange ideas, learn new techniques, obtain valuable business education, address industry issues and, most importantly, "do business." To advance its community of professional businesses by encouraging the passion for needlearts through professional and consumer education, industry knowledge exchange and a strong marketplace. An invigorated needlearts market where all sectors of the industry work in partnership to bring value to consumers and to maintain a healthy and growing industry. 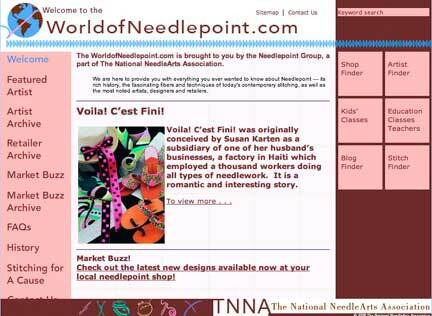 The go-to site for all things needlepoint, sponsored by the Needlepoint Group of The National NeedleArts Association. The Market Buzz section of the site exhibits information about current shows. Each month, they plan to feature either a retailer or artist - or both - so that needlepointers across the country can be ‘introduced’ to the new designs available, as well as the local needlepoint shops that carry handpainted canvases.